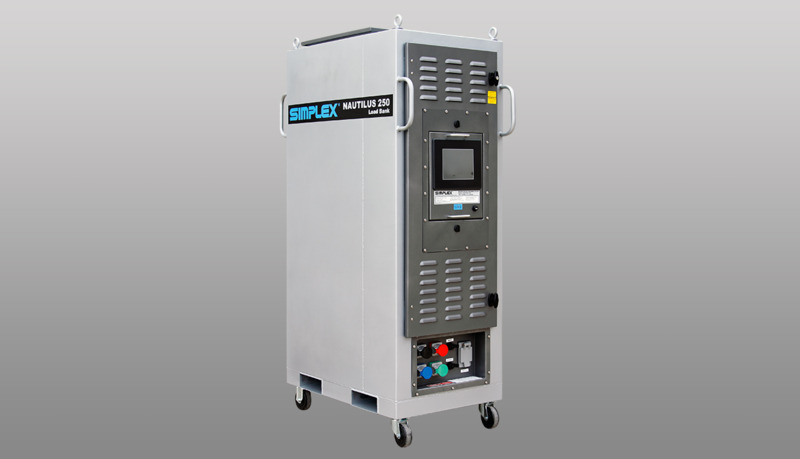 The Nautilus is designed expressly for data-center chiller commissioning and testing applications. The Nautilus-250 is a compact, portable product featuring infinite power and water flow control for precise temperature rise setting versus applied power. The Nautilus is fully networkable for control of single or multiple units from a remote station. Using a PLC with touchscreen HMI, integrated with temperature sensors and flow transducers and controlling an electrically operated water proportioning valve, the Nautilus allows the operator to select precise power levels, versus water temperature rise versus water flow rates. Power level is infinitely controllable over a 0-250kw range. 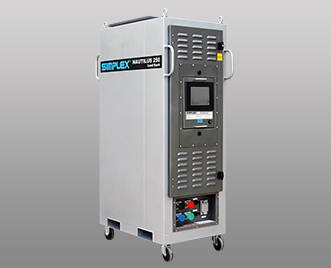 • The load bank is a completely self-contained, freestanding unit, which includes all resistive load elements, load control, load element branch circuit fuse protection, main load bus and terminals, valves and fittings, control power supply, malfunction detection system. • PLC control with 8-inch color TFT touchscreen HMI. Screen is configured for local or remote operation. Remote requires 120v power source. 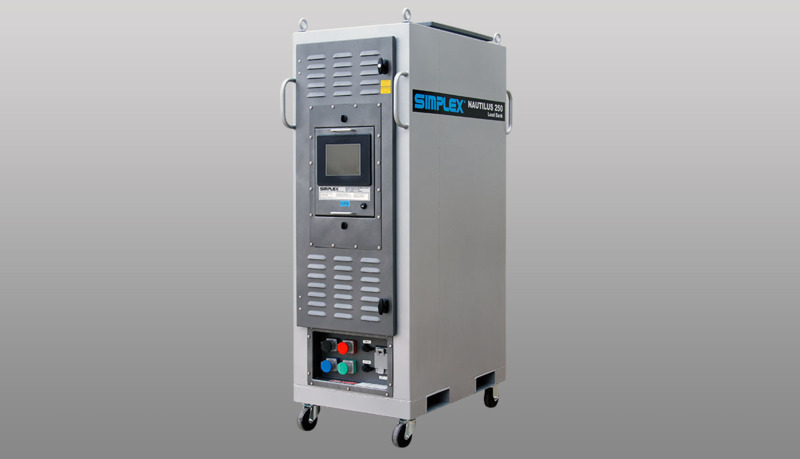 • Master control on-off button; keypad entry of load values, apply and remove buttons; controller calculates reduced voltage load values automatically, applying actual requested load value for the applied voltage up to the reduced voltage capacity of the load bank. Water Flow Control: Either full on or thermostatic control. Thermostatic control is either manual or to a temperature rise preset. Operator interface is a screen based vernier valve control with displays of valve position, flow rate, temp in, temp out, temp rise. Automatic thermostatic control allows operator to enter value of temp rise. Controller then adjusts flow rate to maintain that rise. Controller inhibits over temperature, greater than 180°F outlet temp. 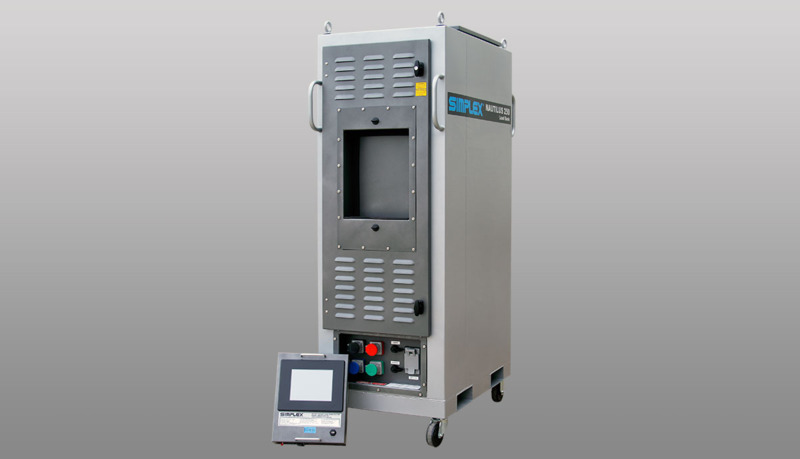 Displays: AC 3-phase voltage and current, frequency, kilowatts. Alarms: high outlet temp, low flow, high pressure Messages: normal operation, valve open, valve closed. Water Flow Control Messages: water inlet temp, water outlet temp, overall temp rise, main manifold water flow rate, valve position in percent of open. • Immersion type, tubular construction, stainless steel or Incolloy sheathed, chromium-alloy conductor. Screw-plug mounting. 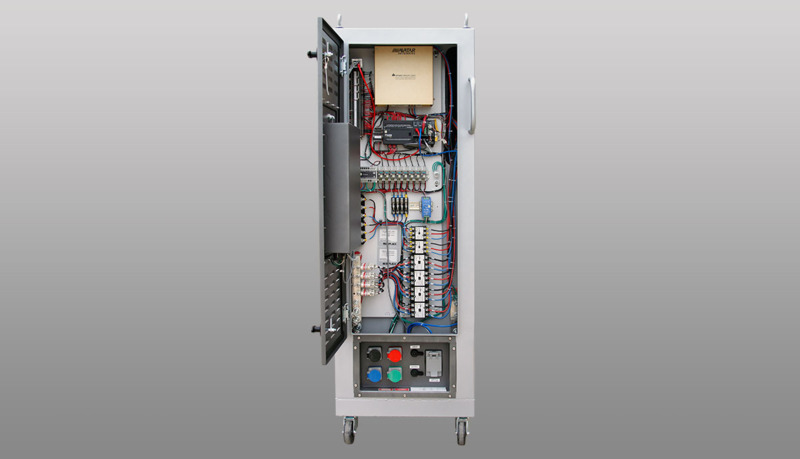 • Triac and Branch circuit contactors, each 25 kw or 50 kW circuit. • Branch circuit fuses, each 50 kW branch circuit or each step. • 90°C, color-coded and numbered. • Cam-Type connectors, 1 x 4/0 (400A) per phase and 1 x ground. Bulk-head mount connectors installed on front. • Main manifold flow transducer, 4-20mA; inlet water temp thermocouple, exhaust water temp thermocouple; cell pressure. • Type 1 indoor freestanding. 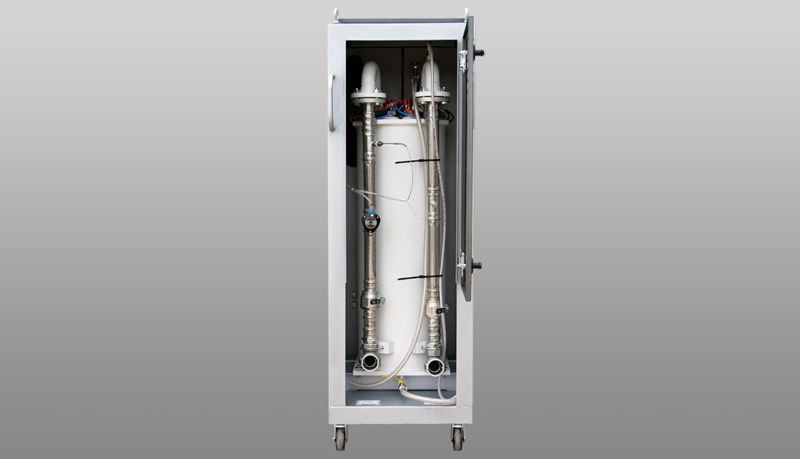 Approx 24” W x 72” H x 36” D.
• Equipped with main inlet and outlet shutoff ball valves, pressure relief valve. Motorized gate valve on inlet for water flow control.